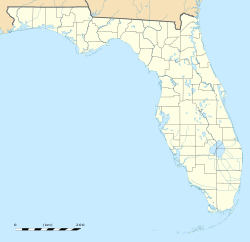 Gulf Coast High School is a public, secondary education school located in northern Collier County, Florida about 15 miles (24 km) from Naples, Florida. The high school opened in August 1998 and is part of the District School Board of Collier County. Gulf Coast High School is one of the seven members of the Collier County Athletic Conference and also belongs to the Florida High School Athletic Association (FHSAA). The school offers the following athletic programs. Gulf Coast High School is home to two different Career Academies. The goal of these programs is to help students that are interested in a certain career. Over the course of their high school education, students enrolled in the Academy take several classes relating to the Academy, some of which are classes specifically made for Academy Students. The Sports Marketing Academy has affiliated itself with the local Hertz Arena. They put on shows and programs throughout the school year. The Medical Academy's goal is to prepare students to pursue a career in any medical field they may be interested in. For prospective students looking into the engineering field. Gulf Coast High School is part of District Six thespians and is International Thespian Society Troupe number 5876. Each year the theatre troupe puts on four main events. First there is a main-stage, full length production. There is also either a musical or dinner theatre, and then there are two shows featuring events scheduled to appear in District competition including Evening Extraordinaire: A One Act affair, and A Dramatic Showcase (featuring Individual Events). Occasionally there are other shows that are produced every few years, including the Pratfalls comedy show which appeared for its third production in 2005, and a Night of Improv, which returned April 2006 after its successful debut in Pratfalls III. The troupe performs in The Performing Arts Hall of Gulf Coast High School, one of the largest auditoriums in the school district. The most recent District Competition took place January 2010. Pieces are rated in the following fashion: Superior, Excellent, Good, Fair, Poor. In 2006, for the first time in troupe history, one theatre student received the award for Best Overall Technical Theatre Piece for their Costume design in the District 6 Competition. This piece was chosen by the judges as the best technical theatre entry out of all the high schools participating, and out of all sub-categories in Technical Theatre. In 2007, three students were chosen to represent District 6 in State Competition. One received the award for Best Overall Technical Theatre Piece for a scenic design in the District 6 Competition, and a duo received the award for the Best Overall Pantomime in the District 6 Competition. In 2010, Gulf Coast High School received further acclaim after receiving straight superiors on their one-act play, and on three individual student's monologues. The students also participated at the Florida State Thespian Competition in Tampa, Florida back in April 2010. In 2004, Gulf Coast High School was one of thirteen schools nationwide that received a $10,000 grant from the Lemelson-MIT Inventeams Program. The program is part of the Lemelson-MIT program which endeavors to foster a spirit of research and invention in high schools nationwide through grants. The GCHS Inventeam's invention was a hybrid between an air ionizing system similar to the Ionic Breeze and a typical ceiling fan. The idea was that the ceiling fan would circulate the air around the room, and as the air flowed over the ionizing system it would be cleaned as well, providing multipurpose from an appliance standard in many households. The GCHS Model United Nations team is one of the premier activities in Gulf Coast High School. Recently expanding its program in 2010, the team has since won delegation awards at Georgia Tech, Columbia, UCLA, Southwest Florida MUN, and Florida High School MUN, with numerous other delegate awards at other conferences. In Fall 2011, the team was ranked 10th in the nation, hardly a year after the expansion of its program. Gulf Coast High School consists of 8 main buildings which enclose a courtyard that is one-quarter of an mile (0.40 km) in size. Most of the building is on a single level, however Building 5, being the largest building, has classrooms on a second floor and the auditorium has a balcony on a second level. The school includes computer labs, a main gymnasium and an auxiliary gymnasium, a 3,000-seat capacity football stadium, cafeteria, media center, TV Production Studio, darkrooms for photography, and an auditorium which is also home to the Opera of Naples. ^ a b c d "Search for Public Schools - School Detail for Gulf Coast High School". National Center for Education Statistics. Institute of Education Sciences. Retrieved March 8, 2019. ^ "List of Collier County Public Schools". Retrieved December 28, 2006. ^ "Gulf Coast High School – Home of the Sharks". Retrieved December 28, 2006. ^ "Gulf Coast High School Athletics". Retrieved August 15, 2006. ^ "Gulf Coast High School – Home of the Sharks". Retrieved May 4, 2008. ^ "FSHAA.org: Sports & Programs". Retrieved May 4, 2008. ^ "Opera Naples". Archived from the original on May 24, 2007. Retrieved December 28, 2006. ^ "Google Cached Page: GCHS Student Announcements". Archived from the original on March 8, 2007. Retrieved January 23, 2007. ^ "Gulf Coast High School InvenTeam". Lemelson-MIT Program. 2005. Retrieved August 28, 2006. This page was last edited on 12 March 2019, at 14:15 (UTC).